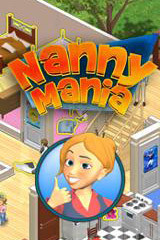 Nanny Mania Free Game Download! Think you can manage a household? Think being a stay at home mom is easy? Well lets give it a Try, Nanny Mania puts you in the heart of what it takes to take care of a regular house. We start you off easy with only on child, and the mom and Dad to take care of in a small house, but you slowly get better but the job does not get easier. Try cleaning, cooking, laundry, and taking care of the parents, 4 kids and a whole heap of trouble. Nanny Mania will challenge you to keep an eye on your duties and manage your time or you will not be the Perfect Nanny! Pros: Keeps ypur attention to the game. Comments: Nanny Mania has a very average graphics. It has that Quality that keeps you looking at the game. Maybe I should add that the game also by make you bored after playing it for so long. But as long as you play it now and then you would not be bored.